Mike and Shirley Johnson hold up an electric shoulder throw at The American Legion Wells-Hussey Post No. 42 in Damariscotta. The post donated several of the heated throws to the Togus Springs Hospice Unit in Augusta. Wells-Hussey Post No. 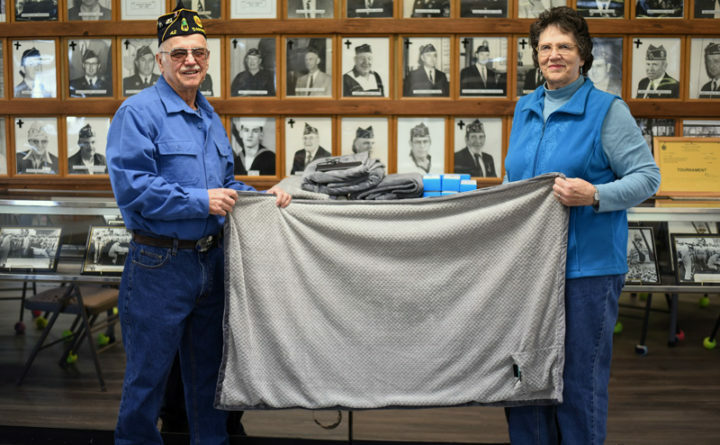 42, of Damariscotta presented six heated shoulder throws with battery packs to the Togus Springs Hospice Unit at the U.S. Department of Veterans Affairs campus in Augusta on Feb. 1. Mike and Shirley Johnson came up with the idea for the donation in December 2018, when Shirley Johnson’s mother’s husband, William Plossay, was a patient at the hospice unit. Mike Johnson served in the U.S. Naval Construction Battalion — better known as the Seabees — during the Vietnam War. Shirley Johnson belongs to the American Legion Auxiliary. They joined the post about 12 or 13 years ago.